Mysterious "night shining" or noctilucent clouds are beautiful to behold, and are usually seen during the summertime, appearing at sunset. They are thin, wavy ice clouds that form at very high altitudes and reflect sunlight long after the Sun has dropped below the horizon. Scientists dont know exactly why they form, but continue to observe them  both from Earth and from space. These images were taken by the Ozone Monitoring Instrument (OMI) on NASAs Aura satellite. Also called polar mesospheric clouds, they are puzzling scientists with their recent dramatic changes. They used to be considered rare, but now the clouds are growing brighter, are seen more frequently, are visible at lower and lower latitudes than ever before, and  as these satellite image reveal  they are now even appearing during the day. Noctilucent clouds form in an upper layer of the Earths atmosphere called the mesosphere during the Northern Hemispheres summer  at an altitude of 80 km (50 miles). They can start forming as early as May, and extend through August. They can also be seen in high latitudes during the summer months in the Southern Hemisphere. Scientist Matthew DeLand of Science Systems and Applications Inc. and NASAs Goddard Space Flight Center has been monitoring polar mesospheric clouds with instruments that were actually designed to study ozone, including the OMI, which provides more detailed and frequent observations than previous instruments. 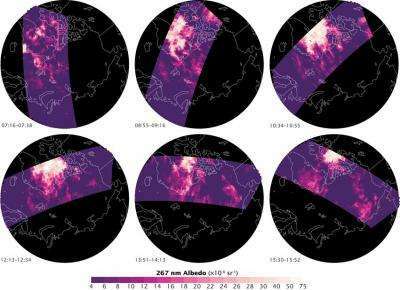 This gives DeLand a way to refine his previous measurements of a long-term trend towards more and brighter noctilucent clouds linked to rising greenhouse gases.